Sunny Girja Singh was born in Cato Manor (uMkhumbane), Durban, Natal (now Kwazulu-Natal), in 1939 to a working class family. His father, Girjabaksh, came to South Africa as an indentured labourer, from Bihar, India. His mother, Gumte Singh, was born in Durban. Singh was the youngest in a family with five brothers and two sisters. There were very few primary schools in the area; so he ended up going to primary school at about 11 or 12 years. He completed his primary schooling (Standard six - Grade Eight) when he was about eighteen years old. He had to forgo high school due to a lack of finance. He went to work as his father had passed away by then. The notorious Group Areas Act of 1950, 1956 Treason Trial, the arrest of Nelson Mandela heightened his political consciousness. It was this that drove him to join the liberation struggle. Singh joined the Natal Indian Youth Congress (NIYC) and the Natal Indian Congress (NIC) in 1956, then under the progressive leadership of Dr G M “Monty” Naicker. He began attending NIC meetings in the city on a weekly basis. By this time, he was working in an exclusive club that catered only for Whites. During the 1956 Treason Trial, he went around helping to collect funds at the Victoria Street Market, to assist the accused. In February 1962, two months after its formation, Singh was recruited into Mkhonto weSizwe (MK) — the armed wing of the African National Congress (ANC) — as a member of a cell in the Durban Central Area. He was under the command of Ebrahim Ismail Ebrahim. The cell was tasked to look for certain targets, such as railway lines, railway signals, power transmission carriers and government buildings. In all, he was involved in four major MK operations. The cell sabotaged the railway line under the Victoria Street (now known as Bertha Mkhize Street) Bridge – this was the main Durban – Johannesburg railway line. His cell was betrayed by a fellow member, who unknown to them was a police informer. He, together with 18 others, was arrested on 7 August 1963 in Durban detained at a police station for about a week or so. During interrogation he refused to cooperate with his captors. He believed that if he confessed to accusations that the police were making against him, he would be implicating himself. As punishment the police would deny him food. In October 1963, the 19 accused were brought to trial at the Supreme Court in Pietermaritzburg, Natal. At the time, the trial was described as one of the biggest in the history of the province. 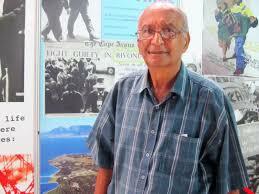 They were convicted at the end of February 1964 and he was sentenced to ten years on Robben Island. On Robben Island the food, the medical treatment, living and working conditions were inhuman. In 1964, South Africa had experienced its worst winter in thirty six years. The prisoners on Robben Island were issued with the bare minimum of clothing (prison uniforms). Black prisoners were not given long pants — even in winter they were forced to wear shorts. These political prisoners were housed with some of South Africa’s most hardened criminals. Prisoners were brutally assaulted and tortured by the warders who punished the political prisoners by denying them food. They were subjected to hard labour under these conditions, for example, pushing an iron wheel barrow in the sea sand; which would not move in the soft sand. As a result the warders would beat them on their backs with batons. This went on for about three or four years. Only due to pressure from the prisoners — hunger strikes, protests, etc. — did conditions for these prisoners improve a little. On one occasion Singh went on hunger strike for about six days. For about eight years, he was responsible for the collection, collation and distribution of news. He and the other political prisoners won over prisoners who were sentenced for criminal activity. These politicised prisoners smuggled radios, newspapers and old magazines that had political news. Singh used to subscribe to a magazine, the “Economist”. When the authorities realised that he was gaining access to news they stopped his subscription. On one occasion, when he was found with a newspaper, he was punished by being confined to solitary confinement for about three days. While on the Island, Singh enrolled for his matriculation (Grade 12). He did not complete his matriculation because he was caught with a newspaper, which the authorities considered a very serious offence. As punishment his studies were taken away. This did not deter him and he continued his self education through reading —specialising in Russian and French classical literature. As he was in charge of disseminating the news he always knew what was happening around the world. Mentally, he was very active; preparing notes for his fellow prisoners, smuggling this to the different groups and the leadership incarcerated in another section of the Island, reading his novels and so on. He would write the news on toilet paper until ten or eleven at night. This was possible since the cell lights were on the whole night. Singh, graded as a D group prisoner, was allowed one no-contact visit in six months. His first visitor was his mother who came to see him in prison in August 1964. Once or twice some friends visited him on the Island. He was released from Robben Island in 1974 after serving his full sentence. When he returned home he was first confined to the Durban Central Prison for a few days. The police told his family that they would bring him home. Of course, this was a lie — they did not take him home; they merely released him. As a result when the prison gates opened, there was nobody there to receive him. Since he had no belt to wear (his was confiscated when he was imprisoned and never returned) he had to go to a shop and buy one. Thereafter, he went looking for his friend and comrade, attorney Phyllis Naidoo at her office. It was quite an emotional reunion. Naidoo then sent off her secretary to buy him underwear as this too was confiscated in prison. Following this he made his way home in Cato Manor. Five days after his release, the state placed him under house arrest; he had to report twice a week to the police station. They imposed severe restrictions on him making it very difficult to find work. He was not allowed to enter any academic premises, printing place or factory. He then found a temporary job, as a bookkeeper, at a medical centre in town. Here he began to organise the nurses and doctors’ secretaries into trade unions. Following his release, he lived with his sister in Chatsworth, south of Durban. Every morning he travelled by bus to town. Unknown to him, a person he used to travel with on the bus was a police informer. Singh was unaware this person was recruited and working for the Security Police. Singh would talk loudly in the bus so people could hear that he was discussing politics. Since he was under house arrest, and travelling in the bus, he could not be accused of addressing a meeting. It was a form of political education for the passengers. He realised that he needed to do political work and begin to look at how he could get involved with community projects. This led him to set up projects in Chatsworth and Merebank. He was able to secure funding from business and professional people. He set up a free legal clinic and medical clinic, where lawyers and doctors would give free medical attention and legal advice. The former Minister of Finance, Pravin Gordhan, who at the time was employed as a pharmacist at King Edward Hospital in Durban gave Singh his full support. While engaged in overt community work, at the same time he was looking for potential members to recruit into the underground structure to engage in the armed struggle. He then recruited Ivan Pillay the former South African Revenue Services (SARS) national Deputy Commissioner. The African National Congress (ANC) ordered Singh to go into exile in Mozambique. He left on Christmas morning, 1976, with the assistance of an ANC underground operative who took Singh and another ANC comrade, Riot Mkwanazi, across the Swaziland border into exile. During his many years of exile he could not come home. He was unable to attend his mother’s funeral, although he was in Maputo, when he received news that his mother had passed away. Only later, months after his mother had passed away, did he learn of her death. After some time, his brother and sister visited him in Maputo with his nephew and nieces. From Maputo, Singh was sent to Angola for training, and then from there to East Germany for further training on a three month course, returning to Mozambique. Singh was then appointed a member of MK’s Natal Command structure, based in Maputo, with the present President of the country, Jacob Zuma, as Chair of the command. Later he was deployed to MK’s Military Intelligence under the command of Ronnie Kasrils. On 30 January 1981 South Africa bombed Matola, a suburb in Maputo, Mozambique, killing a large number of ANC members and Mozambican civilians. Among the dead were senior commanders and very close colleagues of his. South Africa continued to attack Mozambique, imposing a blockade against the country and mounting military operations using Mozambican surrogate forces such as Renamo (MNR). In March 1984, South Africa forced Mozambique into signing the Nkomati Accord. One of the clauses of the Accord was that Mozambique should not provide refuge to ANC soldiers and that ANC leaders and members were to be removed. Singh was then appointed Chair of MK’s Military Committee, in Maputo. He was responsible for infiltrating cases of weapons and other military hardware into South Africa. He managed to achieve these operations successfully without any problems. Singh was also responsible for recruiting one, Catrinia, who assisted to smuggle weapons from Angola through Maputo airport. Catrinia, known as Kate, is the late wife of President Zuma. As a tactical retreat, the ANC deployed Singh to Zambia, where he spent a year. Singh then changed his name to Bobby Pillay, travelling on a Tanzanian passport and then to Kumar Sanjay, this time using an Indian passport. The organisation then deployed him to Holland as its representative. He served about four years in Holland from 1988. During his stay there, he spent his time promoting South Africa’s freedom struggle, giving radio and television interviews and addressing anti-apartheid meetings. He developed tremendous support from the Dutch youth and trade unions. In June 1990, Nelson Mandela visited the Netherlands for the very first time. As head of the ANC’s Mission, it fell on to Singh to facilitate his visit to the country. Singh arranged for Mandela to meet the Dutch Government and the next morning the Dutch Queen, Beatrix. He was responsible for arranging for Mandela to then address 20,000 Dutch people gathered at The Square on 16th June. Two months after Mandela’s release from prison, the London Anti Apartheid Movement (AAM) hosted an official international reception — a music concert that took place on 16 April 1990 at Wembley Stadium, London that was broadcast to more than 60 countries around the world. Although he had tickets to attend this historic concert, Singh did not attend. Instead he organised a big screen which nearly 10 000 people watched the entire concert streamed live to Amsterdam. Singh returned to South Africa, from exile, in 1991. He established an educational programme, Credep, dealing with integration for school children in KwaMashu and Inanda. He was a member of the NIC team, a part of the alliance of the ANC, at the Convention for a Democratic South Africa (Codesa) talks where the new constitution for a democratic South Africa was being forged. After 1994, he was absorbed into the police Crime Intelligence Service in Durban, where he served until 2008. Sunny Girja Singh is presently retired but actively involved in numerous community projects working towards entrenching a non-racial democratic society.